March is Deep Vein Thrombosis (DVT) Awareness Month and a good time to talk about risk factors for DVT. Deep vein thrombosis, or DVT, is the formation of a blood clot inside the deeper veins of the body, especially in the legs. Some DVTs may not have any symptoms but most cause pain, swelling, and warmth in the leg. If untreated, people with extensive DVTs are at risk for developing a pulmonary embolism, in which the blood clot breaks away and travels to the lung, which can be life threatening. More than a2 million people in the United States are affected by DVT each year and more than 600,00 people are hospitalized. As we begin our spring and summer vacations, you should know that extended travel in a car or on an airplane or train increases your risk for this serious complication of vein disease. The danger of extended travel is greater if you have cancer, had recent surgery, are pregnant, overweight, smoke, use hormone therapy or oral contraceptives, or have a history of blood clots. Certain genetic conditions, such as the presence of Factor V Leiden, may also increase your risk. Stay hydrated. Drink lots of water and avoid caffeine or alcohol because both are dehydrating. Wear loose, comfortable clothes during the trip. Get out of your seat every hour or two and walk. In an airplane it is helpful to request an aisle seat so it is easier to stretch and move around. In a car, stop and walk around for a few minutes for every 2-3 hours of driving. Move every half hour or so while you are seated. Rotate your ankles, draw circles on the ground with your toes, flex your feet and toes and raise your legs slightly and hold them in the air for a few seconds. Avoid prolonged crossing of your legs while you are seated since this may impede venous circulation and can cause blood to pool in the veins. Studies have shown that wearing compression stockings during a trip can significantly reduce your risk for DVT. These stockings help increase circulation in your legs. Make sure to purchase medical grade stockings, fitted by a trained professional. Taking these simple actions will decrease your risk for DVT and give you a happier, healthier trip. 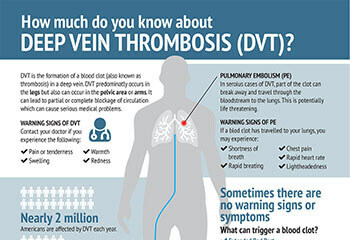 Are you concerned about DVT? Schedule a Consultation with Indiana Vein Specialists by calling 317-348-3023 or click here.